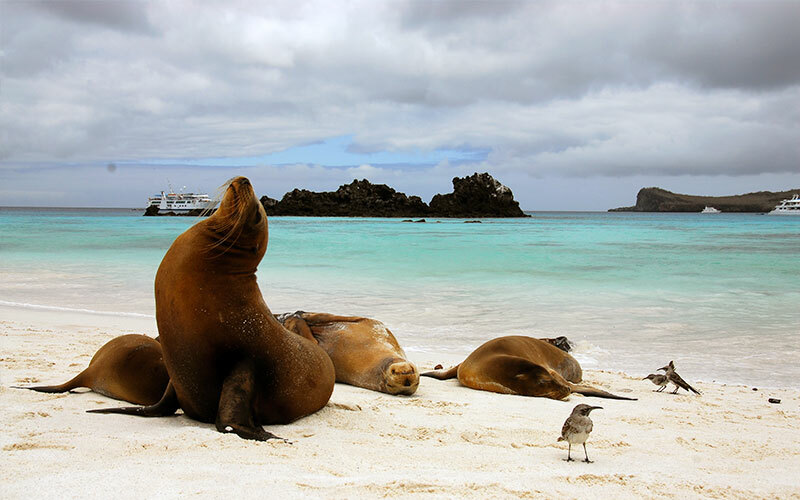 The Galapagos Island’s coasts are a playground for both their visitors and residents. Sea lions dart the shores, crabs dart across the sands and blue footed boobies congregate along the rocks and crags of its coves. The best beaches in the Galapagos are as diverse as the islands themselves, boasting white stretches of sand home to an amazing array of animals. While not well known for its sunbathing or surfing, the islands have their fair share of hidden hotspots. 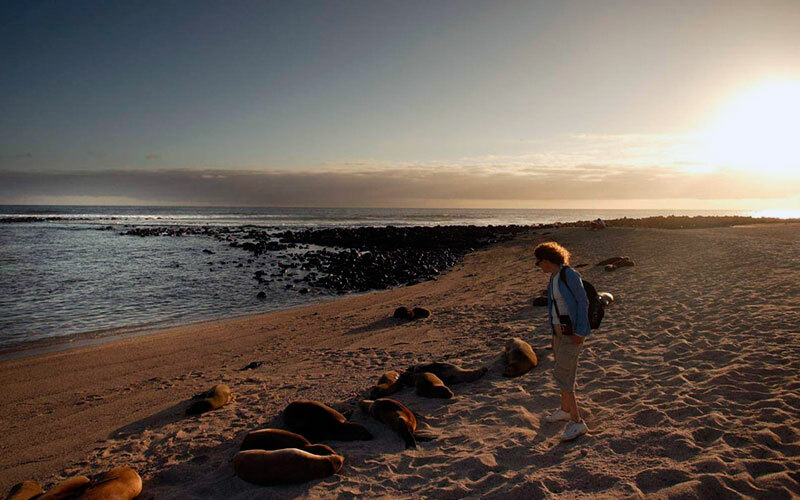 Bahia Gardner on the northern coast of Española Island was named one of the best beaches in the world for its animal life and the amphitheater in which they live. 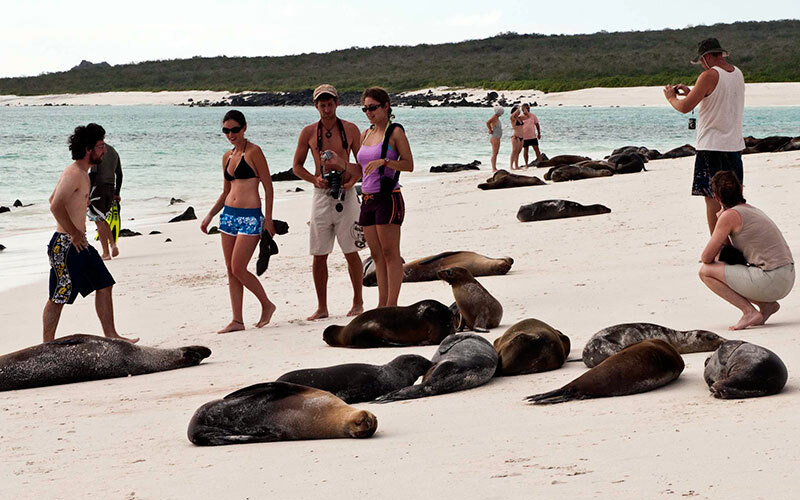 To see for yourself the exotic beaches of the Galapagos, consider visiting the following shores. Garner Bay is considered one of the best beaches in the world for good reason. Its stunning white beach shaded by palm trees is the Galapagos at its best. Snorkelers revel in manta rays and sea lions that swim within sight of land and crabs scamper around resting sea lions and red lava lizards on the beach. Looking out over calm blue waters shrouded by the sprawling blue sky, you’ll see why it’s a popular stop on most visitors list. Named for the sea turtles that come to the far end of the long, stretching beach every night to lay eggs, Tortuga Bay is a great day trip when visiting the island. A short walk out of town, it’s the place to surf, kayak and snorkel with the playful creatures that live there. On land there is a colony of marine iguanas, as well as sea lions, pelicans and slender flamingos. The beach is actually divided into two and is a popular turn around point for kayak tours, which start in Puerto Ayora and travel ten miles of up the coast and back again on a six hour trip. Snorkeling is popular at the second beach, as its calm waters and lagoon offer a clear view of the underwater world, alive with marine life. 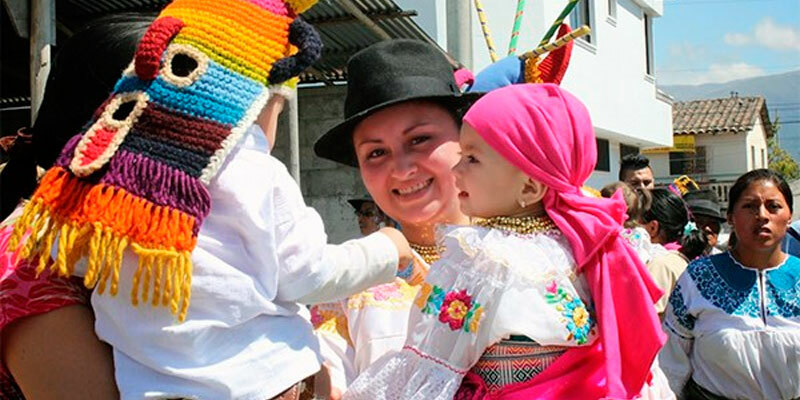 Puerto Villamil is the port of the island and home to most of its residents. It’s a sleepy town with a laid back pace, which adds to the enjoyment of spending an afternoon along the white sandy stretch of paradise snorkeling or swimming in the placid blue waters. 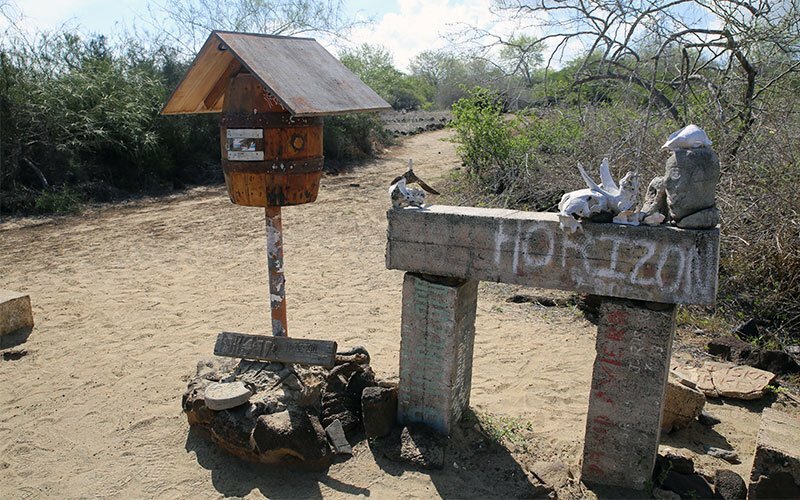 Nearby is a tortoise breeding center, found by taken a wooden boardwalk from the southwest edge of town. The center’s aim is to preserve Isabella’s five species of tortoises, each distinct for being discovered near one of the island’s five volcanoes. 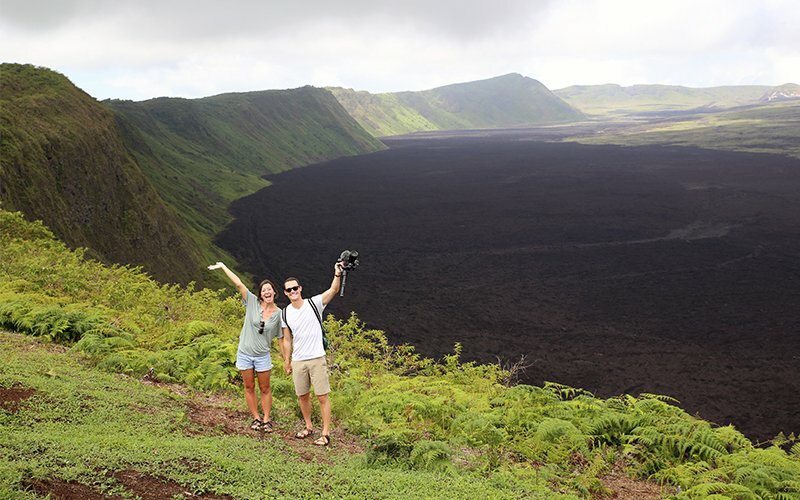 A trip to the Galapagos Islands means that you are always a stone’s throw away from another sight that will leave you searching for your camera. 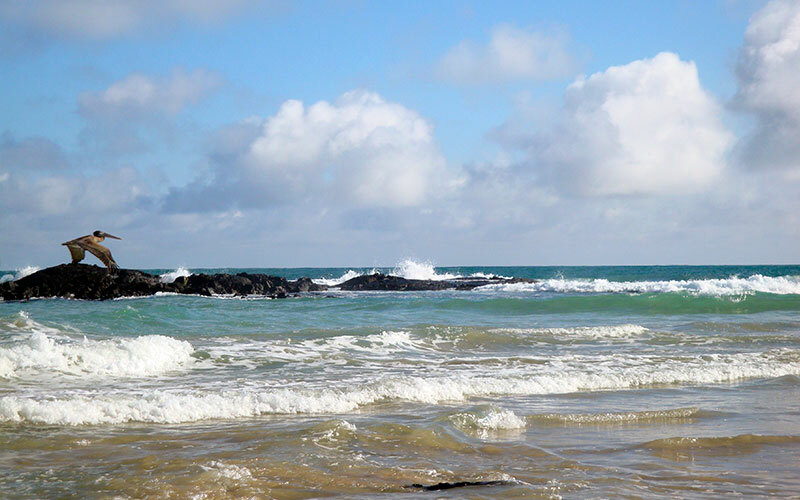 Take some time before you go to explore your options with one of our travel experts and put the best beaches is the Galapagos on your itinerary.